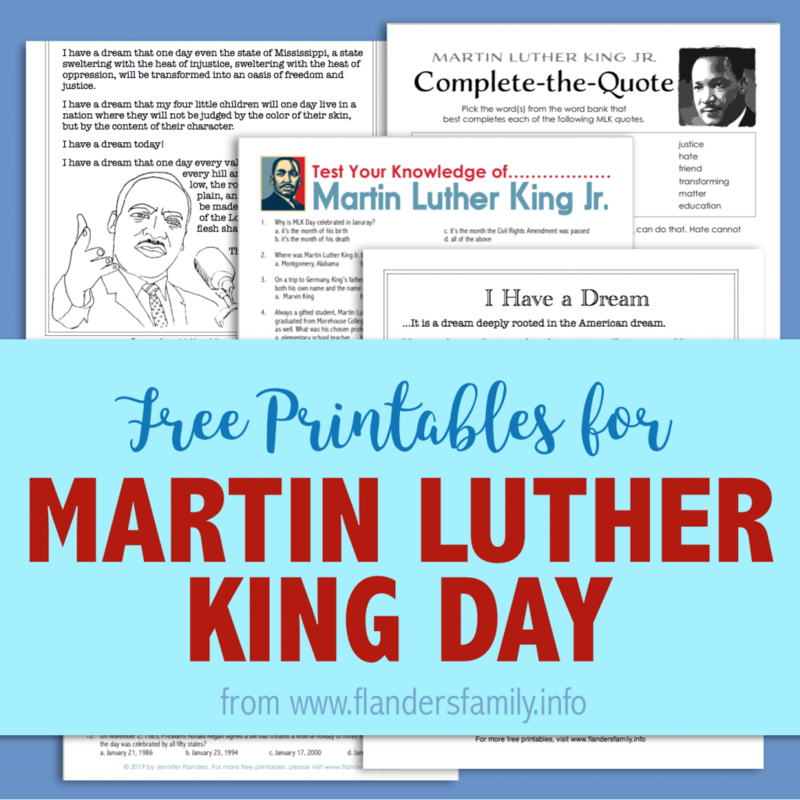 Since MLK Day is just around the corner, I wanted to share a few more resources to help you educate while you celebrate. 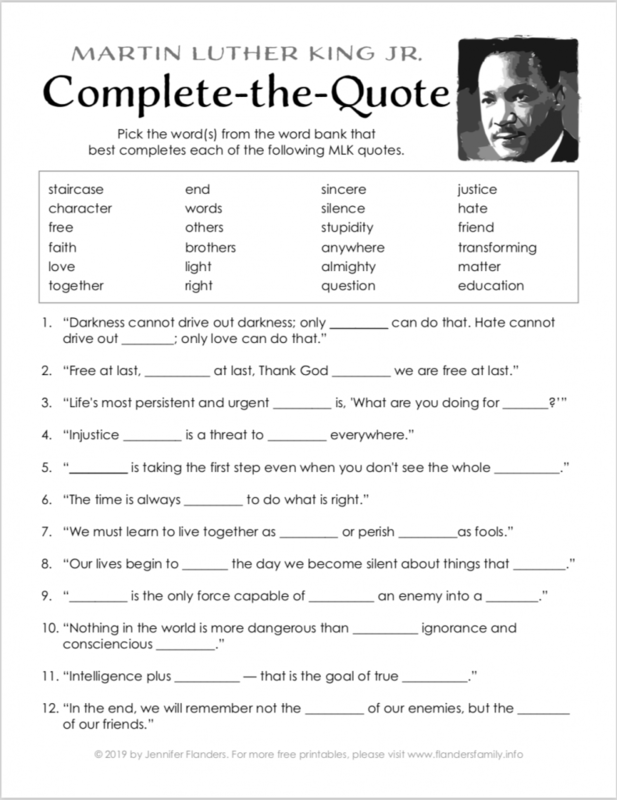 First, you can fill in the missing words on a dozen quotes by Martin Luther King Jr. Check your answers on page 2 of the printable to see how much you think alike. 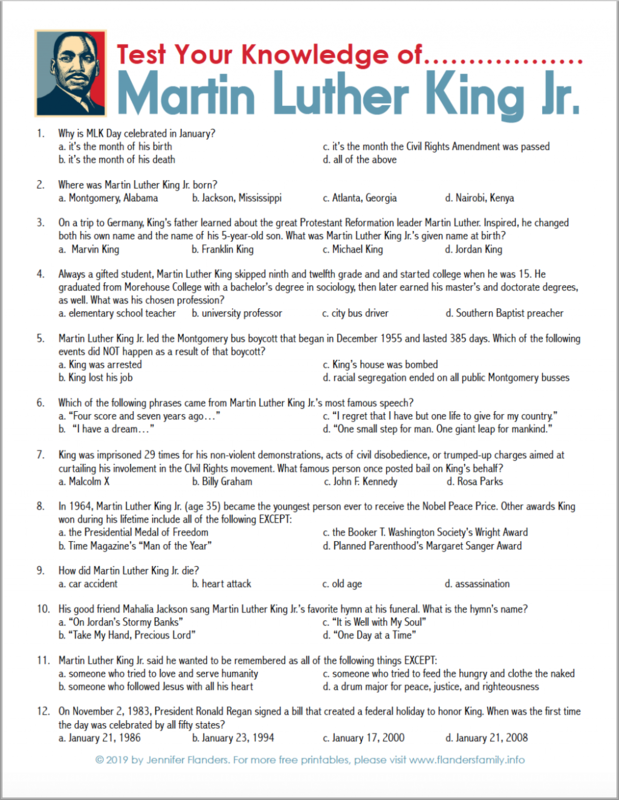 Next, try your hand at our Martin Luther King Jr. Quiz to see how much you really know about this famous Civil Rights leader. Why is MLK Day celebrated in January? Where was Martin Luther King Jr. born? On a trip to Germany, King’s father learned about the great Protestant Reformation leader Martin Luther. Inspired, he changed both his own name and the name of his 5-year-old son. What was Martin Luther King Jr.’s given name at birth? Always a gifted student, Martin Luther King skipped ninth and twelfth grade and and started college when he was 15. He graduated from Morehouse College with a bachelor’s degree in sociology, then later earned his master’s and doctorate degrees, as well. What was his chosen profession? Martin Luther King Jr. led the Montgomery bus boycott that began in December 1955 and lasted 385 days. Which of the following events did NOT happen as a result of that boycott? 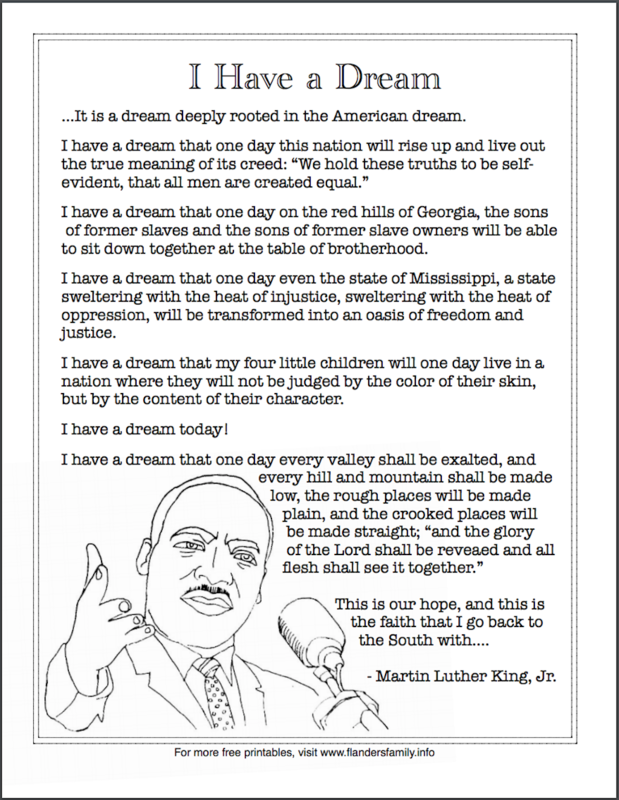 Which of the following phrases came from Martin Luther King Jr.’s most famous speech? King was imprisoned 29 times for his non-violent demonstrations, acts of civil disobedience, or trumped-up charges aimed at curtailing his involement in the CIvil Rights movement. What famous person once posted bail on King’s behalf? How did Martin Luther King Jr. die? His good friend Mahalia Jackson sang Martin Luther King Jr.’s favorite hymn at his funeral. What is the hymn’s name? On November 2, 1983, President Ronald Regan signed a bill that created a federal holiday to honor King. When was the first time the day was celebrated by all fifty states? I made a color version and a black-and-white version of this quiz, so you can conserve ink if you need to print multiple copies. You’ll find the answer key on the final page of the PDF — be sure you don’t peek too early or print more copies of the solutions than you need. 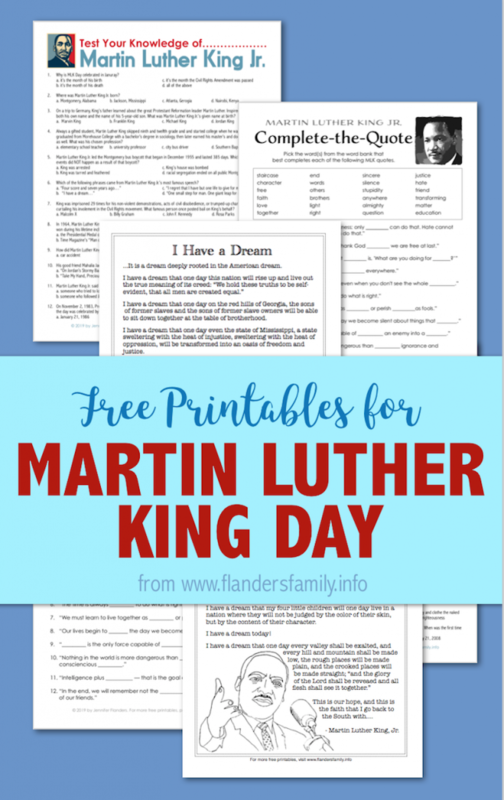 I hope these resources will help the day be more meaningful to you and your kids. Enjoy your day off! Thank you so much! I love this!!! You’re so welcome. I’m glad to hear it. Sure thing, Peggy. Happy to do it!